PHILADELPHIA, PA – December 11, 2017 – Janney Montgomery Scott LLC (“Janney”), a leading full-service wealth management, financial services, and investment banking firm headquartered in Philadelphia, PA, announced the hiring of David Varela. Varela will serve as complex manager of the firm’s Boston and Danvers, MA and Portland, ME offices. 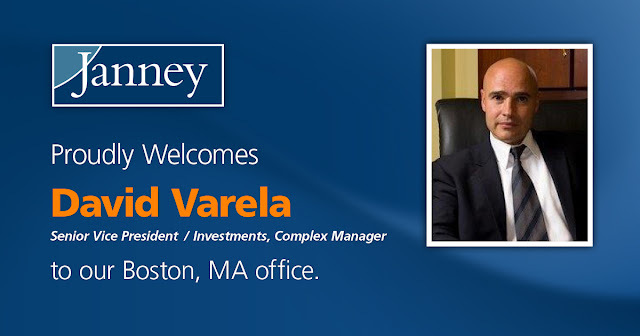 Varela, Senior Vice President/Investments, previously served as complex manager for Raymond James. He has 24 years of industry experience, splitting his career to this point between Morgan Stanley and Raymond James. Jimmy McKenna, who preceded Varela as Boston, Danvers, and Portland branch office manager, will continue to oversee the firm’s South Shore and Cape area branch offices, located in Falmouth, Hingham, and Osterville, MA.